Democrat Steny Hoyer Says Michael Steele is Being "Slavish"
Sadly, this is not the first time that Steele has had to deal with a racist attack from democrats. Representative Steny Hoyer (D-MD)says Republican Senatorial candidate Michael Steele is acting “slavish” (of or befitting a slave)… Nice! Personality is another contrast that might favor Steele. Black voters account for about one quarter of the state’s electorate; President Bush carried only about 10 percent of them in 2004, according to exit poll interviews. If Steele can win 25 percent of black voters, he could pull off an upset. 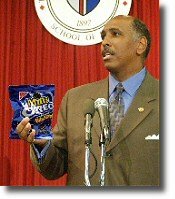 Of course it was just last month that one of Cardin’s staffers joked about people throwing oreos at Michael Steele. Do you suppose this will get as much play as “macaca” did in Virginia? Michelle Malkin has more on the attacks on Steele today.